There are so many things not to like about Jane Goes Batty (Ballantine) that I was truly surprised to find myself with the reverse feeling almost as soon as I began reading. It should be a completely detestable book. First of all, of course, it features vampires at a time when we seem to be completely sa turated with all sorts of permutations of the creatures. 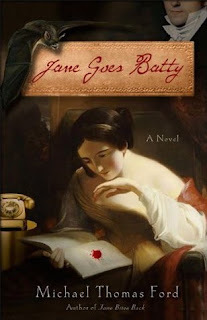 Then there’s the fact that, since Jane Goes Batty is also a bit of a Jane Austen novel, it’s kind of a mash up, and it isn’t as though we don’t have enough of those, as well. Despite all these nos, though, Ford delivers an original take with a sharp and well-formed wit. I found myself laughing and groaning in no time at all. Jane Goes Batty follows up 2010’s Jane Bites Back by the same author. The premise is continued, as well. Regency authoress Jane Austen long ago became a member of the undead and is now living in a small town in upstate New York. In the latest book, Hollywood gets added to the literary mix when a pack of reality TV hounds show up snapping at Jane’s heels, threatening to reveal her true identity if she doesn’t play ball. It’s tough to reconcile what you feel going into Jane Goes Batty with the reality of this very engaging book. On the one hand, everyone knows that both Jane Austen and vampires are capable of creating bookstore line-ups. It’s not entirely cynical to be suspicious of a book that mashes up both of those things. On the other, though, there is a certain acerbic charm here. Adults who enjoy reading for the fun of it will likely enjoy this one. This may be my favorite review ever! Good review, but just the sight of the v-word is enough to keep me away from the book.